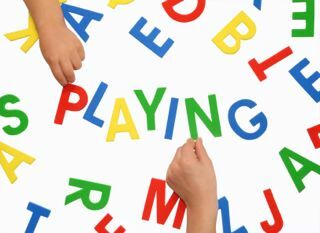 Teaching word families to your child can form a useful part of helping your child learn to read. 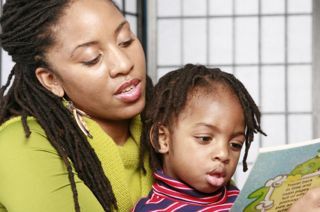 A knowledge of word families helps your child to recognise unfamiliar words quickly and so builds their confidence during the difficult early reading stages. Teaching word families is an integral part of teaching reading using analytic phonics. Single syllable words can be broken down into two parts - the onset at the beginning, which is usually a consonant or consonant cluster, and the rime at the end. So, for example, in the word 'bright', 'br' is the onset and 'ight' is the rime. By varying the onset, you create a family of rhyming words such as 'light', 'fright' and 'sight'. A word family is therefore a set of words with the same rime. Grouping words into word families helps to improve the predictability of letter sounds. The sounds that letters make vary depending on the other letters around them. For example, think of the many different ways to pronounce 'a' depending on the word (eg map, cake, boat, head, said, salt, eat). Letters grouped together in a rime within a word family form a stable unit, which sounds the same in the majority of the words it appears in. This increases the probability that your child will read the letters correctly. Why Is Teaching Word Families Useful? Read unknown words by comparing them to known words If your child recognises that the rime segment of an unfamiliar word is identical to that of a word family they already know, they can then blend the known rime with the new word onset, in order to read the new word. Improve reading fluency Decoding new words by comparison to known word families is quicker than having to decode the word one letter at a time, since the rime is already known as a word chunk. 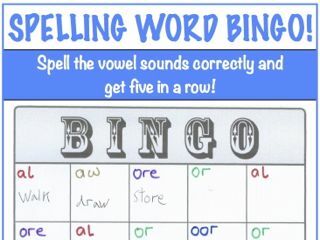 For example, if your child knows the '-and' word family, to read the word 'bland' they just needs to blend together the sounds for 'b', 'l' and 'and', rather than for all five letters. Improve spelling If your child is struggling to spell an unknown word, you can encourage them to search for a similar word in a word family which they already know how to spell. By changing the onset of this known word they will then be able to spell the new word. According to Wylie & Durrel (1970) the 37 most common word families can be used to learn 500 words. You can find examples of words in each of these families, plus a few additional families here. -ore as in more, shore, store, wore. 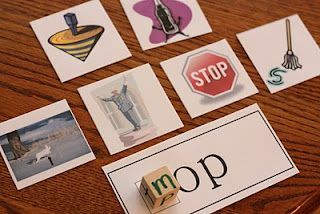 There are many fun and engaging activities you can do with your child when teaching word families. 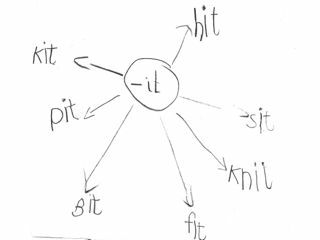 One of the simplest is to write the rime of your chosen word family in a circle in the middle of a page and draw arrows out from the circle. Then ask your child to hunt through a book you have recently read together and find words which belong to that family, writing each word at the end of an arrow. When you have exhausted the words in the book, add additional ones which you brainstorm together. Another good way of hunting for word families in a book, is to cut out a small window in a piece of card which corresponds to the size of the rime you are looking for in that particular book. The size of the window will vary between books depending on the typeface in the book. I found it easier to cut out the window if I folded the card in half and cut along the crease. Then ask your child to hunt for words containing the rime. Each time they find a word from that word family they should place the card over the word such that the rime appears in the window. 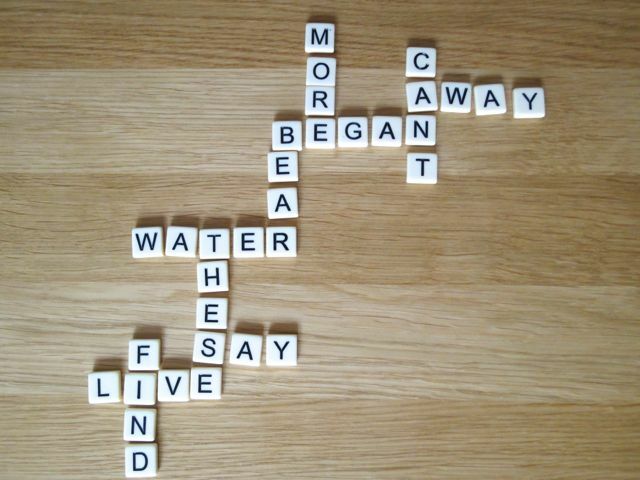 My children and I have had a lot of fun playing this commercially available game, POP for Word Families, where you try to win as many popcorn pieces as you can by making words with the right word-ending. You could also try this online word family game from ReadWriteThink. Drag each new word to the correct word family column. Ask your child to say the word aloud as they drag it. Here are some of my other favourite ideas for practicing word families which you can find on the internet. Cut a small, spiral-bound book in half and write the onsets on one half of the pages and the rimes on the other half. Watch your child have fun making real and imaginary words as they flip the pages. From Quirky Momma. Write a rime on one half of a plastic egg and different onsets on the other. Ask your child to rotate the egg and make the different words in the word family. From Tales of a Teacherista. Pick a rime card then roll the letter dice to reveal an onset and make a word. Match the word with the corresponding picture. Print the resources at I Can Teach My Child. 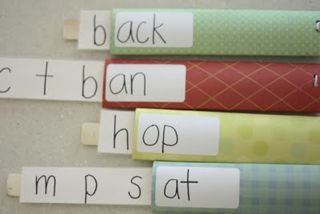 Try this unusual idea for teaching word families from Michelle's Charm World. 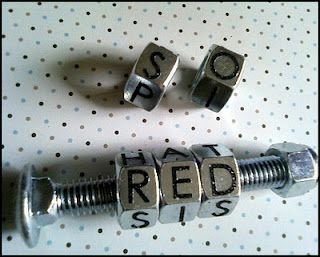 Stick letters on bolts and then screw the bolts onto a screw. Ask your child to spin the bolts to make different words. 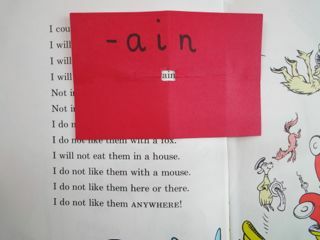 In this idea from No Time For Flashcards your child creates a literal 'family' of words. 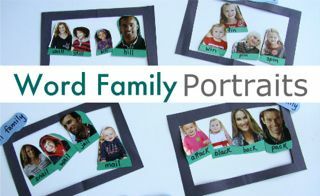 Write words from certain word families under pictures of mums, dads and children and ask your child to arrange the people into the correct family. This is another activity from I Can Teach My Child. Using kitchen roll holders and paint stirrer sticks make these fun learning tools. Watch your child slowly pull out the inside stick and create lots of words in the word family.